Bride and Groom alone with a very dramatic and colorful background in Balboa Park in December. This is when the park is all lighted up for December Nights. Sometimes, we are commissioned for smaller weddings, possibly because something about it really appeals to us or the location is one that we’ve long wanted to work at. This one we were excited to take on because we never knew their location existed! 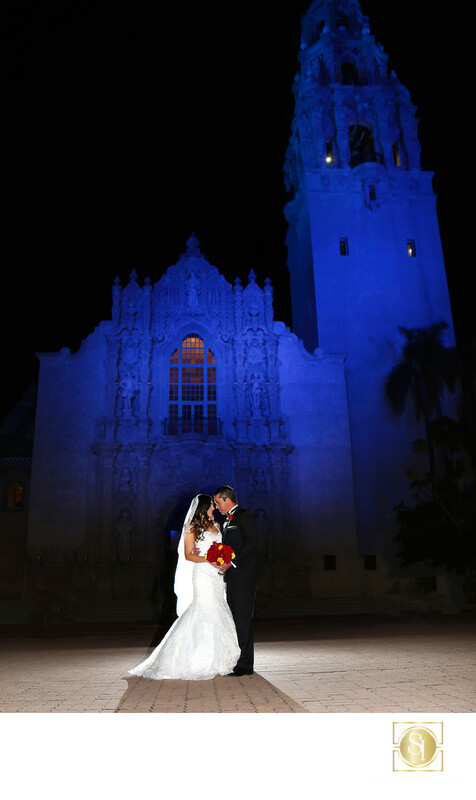 The couple got married at the Saint Francis Chapel in San Diego’s Balboa Park, a tiny little chapel actually below street level at the very entrance to the park. Very few people even know it’s there. I’ve lived in San Diego all my life and only vaguely remembered hearing about it years ago. I figured it had gone the way of so many older sites, lost to remodeling along the line. When these two came to us and said that was where they were getting married just before Christmas, we were really excited. Balboa Park really lights up for the Holiday season and we looked forward to getting our couple out there in the lights! Our new cameras, like most of the top line pro gear, shoot really well in very low light, which lets us get images like this one. Having cameras that allow us to balance ambient light from the surroundings with our flash lets us get photos that a few years ago were difficult, if not impossible to get for our clients. Any good wedding photographer needs to be able to take advantage of every detail to give their clients the best results, and we pride ourselves in doing just that. From our years of experience as fine art photographers to more than a decade as one of San Diego’s leading husband and wife wedding photographers, we can get beautiful images in pretty much any surroundings. Keywords: Balboa Park Wedding (21), san diego photographer (18), wedding photo inspiration (162).